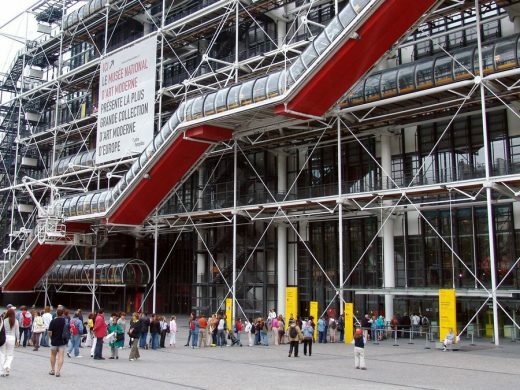 Italian architect Renzo Piano is to design replacement escalators at the Pompidou Centre in Paris as part of a £90m renovation marking the 40th anniversary of this iconic Parisian building. This world-famous modern Parisian building turns forty this year. The anniversary is to be celebrated with preparations for a two-year building facelift expected to cost at least €100m. The building renovations will include replacing the “caterpillar”, the famous escalators on the front of the building, but won’t result in any changes to the building’s overall appearance. Additionally, museum officials are hoping that renovations can occur without closing the Centre. Much of the building structure is of course located externally, so has suffered from continual exposure to the elements. Some external features, such as the large coloured funnels that were once part of the air system, are now just decorative. Exhibitions, shows and get-togethers will be presented in forty French cities, in partnership with a museum, a contemporary art centre, a theatre or a festival. Right up to early 2018, in forty cities from Grenoble to Lille by way of Le François in Martinique, Chambord and Nice, ranging from evening events to six-month exhibitions, proposals mingling exhibitions, concerts, theatre, dance and talks invite every type of audience to experience and share the originality of the Centre Pompidou. First retrospective in France dedicated to one of the later formation of the architecture of the postwar, from Italy, “The Tendenza, Italian Architecture, 1965-1985” presents a selection of over 250 drawings, models, photographs, paintings, films, and a very rich literature. The exhibition traces the highlights of the movement which Aldo Rossi was the leader. Rejecting the notion of avant-garde utopia and to initiate a political architecture and critical engagement with reality, the Tendenza is a new approach of the architectural project based on a revival of the drawing and image. New building in Metz, France, by Shigeru Ban architect. Radical building for its time with service ducts expressed on the exterior and all structure glamourised and articulated externally where possible. The architectural realisation of some Archigram ideas, with escalators providing dynamism to the main west facade. Half of the plot was given over to a rectilinear square which again added dynamism to the architecture. Also known as the Beaubourg Centre or simply The Pompidou building. 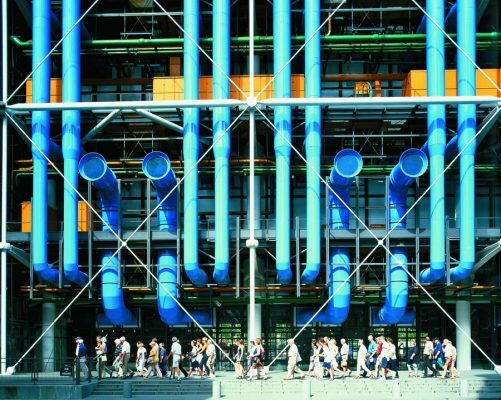 Renovation of Centre Georges Pompidou took place in 1995 by Italian architecture firm Renzo Piano Building Workshop (RPBW), led by architect Renzo Piano who worked on the original building with Richard Rogers. Richard Rogers Partnership are based in London, England, UK. This British design practice made their name from early Hi-Tech buildings, mostly in the UK. A major early work is the Lloyds of London headquarters building in the City of London, England. Renzo Piano Building Workshop are based in Genoa, Italy. The architecture practice opened a Paris studio in 1987. Architect Renzo Piano was awarded the Legion d’Honneur in 1995.